We had a very interesting talk on 18th October from Ian McCaskie (a visitor services volunteer) about the SS Great Britain. The bare bones of the history of the ship’s launch to re-launch is fairly well known and details are on their website, (www.ssgreatbritain.org) but the extra details Ian gave us were fascinating. He began by outlining the historical context. In the 1830’s steam engines had an enormous impact on the way that we were able to travel on land and water. A lucrative contract was on offer for the provision of 4 wooden paddle steamers to carry Royal Mail from England to America. 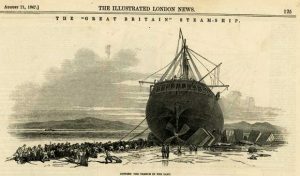 Cunard was expected to tender for the contract but a rival company was set up to compete for it; this was the Great Western Steamship Company and the directors decided to appoint Isambard Kingdom Brunel as their chief consulting engineer. Although Brunel had never designed a ship before, he was asked to do so on the basis of his work with the Great Western railway. When it came to designing his second ship, Brunel started to think about how it could be improved. Up until then all ships had been made from timber but Brunel realised that a timber construction had limitations. It limited the size of the ship and because of the density of wood it was heavy and therefore slow. Around this time a coastal vessel called the “Rainbow” came into Bristol, which had an iron hull that made it much lighter and therefore faster in the water. Brunel suggested to the directors of the Great Western Co. that their second ship should have an iron hull and they agreed. 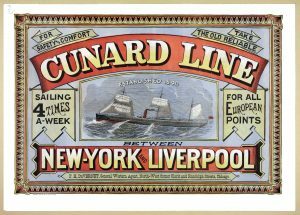 Although the contract for the Royal Mail to the US was subsequently given to Cunard the company realised that iron ships were the way forward. 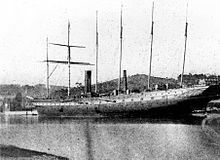 Brunel had observed from building the Great Western that the propeller worked unevenly in the open seas and so, having seen another ship, the “Archimedes”, which came into Bristol at this time and which had a screw propeller, he designed his second ship with a screw propeller. 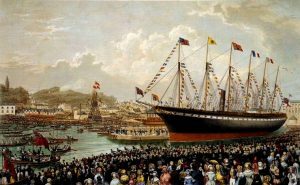 The SS Great Britain was, therefore, the first ship with an iron hull and a screw propeller and was then the biggest, fastest ocean-going transatlantic liner. In 1843 it was ready to launch. 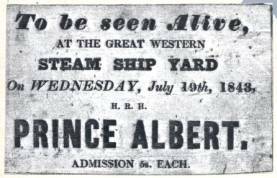 Prince Albert, consort to Queen Victoria, attended the launch and was thankfully on hand to throw a second bottle of champagne at the ship when the lady designated to do it had missed with the first bottle! 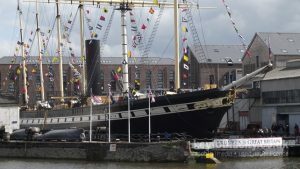 Having undergone sea trials, the SS Great Britain then went from Liverpool to New York. There were berths for 250 first and second-class passengers on its maiden voyage but only 45 tickets were bought. It’s thought that this was because people were concerned about the safety of the vessel. Wood floats and iron doesn’t! From then of the ship had a fairly chequered history. 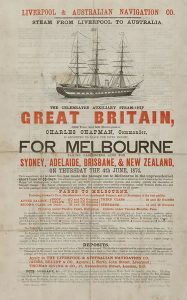 When gold was discovered in Australia in 1851, there was a sudden massive demand for ships to take people out there and the ship underwent a radical re-fit by the new owners Gibbs Bright & Co to become a 3 masted square–rigged sailing ship with auxiliary engines, which could do the voyage non-stop from Liverpool to Melbourne. In 1852 they carried 700 passengers. It cost 70 guineas (equivalent now to £5000) to travel to Melbourne first class and even in steerage it cost the equivalent of £1500 in today’s money. The journey took just 2 months. A record of a trip in 1860 reveals that they also took a lot of live animals including 38 pigs, 2 bullocks 30 turkeys, 133 sheep, 400 geese, 420 chickens and 300 ducks and a dairy cow! 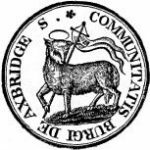 In the 1850’s the ship was requisitioned by the British government to take troops to the Crimean war and also to the Indian Mutiny and in 1861 it took the All England cricket team, including W.G. Grace’s brother, to Australia. 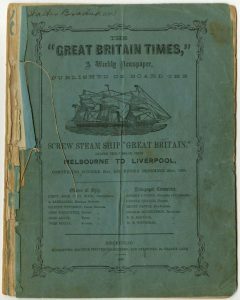 Passenger diaries have revealed what they did on board during those long trips: they played board games, sang, played music and even had their own newsletter called The Great Britain Times which has been an invaluable resource in piecing together what life was like on board. Passengers on these voyages were always segregated by class and gender with males and females being separated at either end of the ship and with families and married couples in the middle. Clearly this didn’t always work to plan!! In one woman’s diary she reveals that a certain Mrs Hodgson in First Class became “rather familiar” with a “rather shady man” and all the ladies “cut her” and she was referred to as a “lively woman” by the sailors. In a honeymoon diary the writer says that there was an enormous amount of food consumed which was of excellent quality. Apparently they had breakfast at 9am, lunch at 12, dinner at 4pm, and tea at 7.30. The menus were very impressive! Clearly all the passengers ate extremely well, although there were also reports in the diaries of a lot of sea-sickness. And there were a lot of rats!! One woman in first class says that she had seen rats in her cabin and reported that one woman had her toe-nails bitten by a rat. 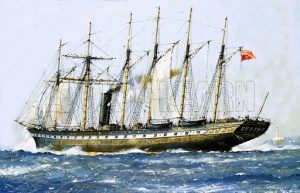 By the late 1870’s the ship had been round the world over 30 times and had transported 16000 emigrants but the demand for trips to Australia was diminishing and Gibbs Bright laid the ship up on the Mersey. In 1882 due to a demand from America for high-grade coal, Antony Gibbs & Son, bought the ship, stripped out the engines and the passenger accommodation and converted the ship to a windjammer cargo ship. As Ian pointed out, it seemed that, technologically, the SS Great Britain had gone backwards from her days as a great transatlantic liner. Worried about the strength of the hull, once everything had been stripped out, the owners covered the iron in pine planking and soon it was taking coal from Penarth in Wales to San Francisco via Cape Horn. 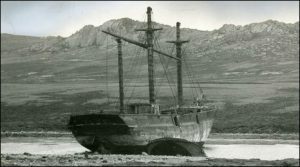 They made two round trips but on the third trip out, in 1886, it was damaged in a storm going round Cape Horn and was taken to the Falkland Islands where they hoped to repair it. 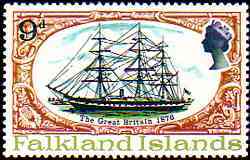 The cost of repairing the ship was considered uneconomical and so she was sold to the Falkland Island Company for £2000 where it became a warehouse primarily for coal, wool and grain and was moored at Port Stanley Harbour. It remained there until it was so rotten that they moved it to Sparrow Cove in 1937 where it was scuttled. Despite being abandoned, she still had some uses. In WWI she was used as a bunkering station and in WWII plates were taken off her to repair damage which had occurred to the HMS Exeter during the Battle of the River Plate. Throughout her time at Sparrow Cove the children of the island greatly enjoyed her presence, using her as an adventure playground and picking mussels from the hull to take home for their tea. In the late 1960’s Ewan Corlett (a noted maritime architect) wrote to the Sunday Times about the tragedy that this great ship had been left to rot and suggested she be brought home. The Admiralty did a survey and thought it was possible to do so but that it would be expensive. 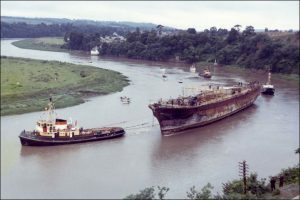 A committee was formed under Lord Strathcona, which launched an appeal to save her and, in early 1970, Sir Jack Hayward gave the money to pay for the salvage operation. The idea was to remove the 3 remaining masts and to float the ship on a floating pontoon and tow it back to the UK. It was found, however, that the islanders had a cut a hatchway in the middle of the hull to facilitate its use as a coal store and, after it had been scuttled, a crack had developed and there was an 18 inch wide split in the hull. Clearly they couldn’t re-float her like that and so Lord Strathcona launched an appeal for mattresses and the islanders responded. Twenty mattresses were cut into strips which divers then jammed into the crack. Concrete was also used to repair the split, air was pumped into the pontoon tanks and in the spring of 1970, ready to embark on the 8000 mile tow back to Bristol. 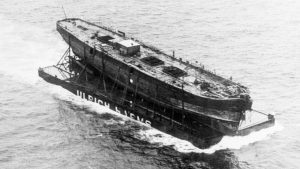 The ship was taken to Avonmouth and remained on the pontoon for 49 days while they made her water-tight by bolting steel over the cracks so that she could come off the pontoon. On July 5th 1970 she went from Avonmouth to Bristol where 100 thousand people watched her arrived. Many were astounded that such a rusty old ship was being brought back!! For the first time in her life she went under the suspension bridge and arrived at St Augustine’s reach. The idea was to put her back into the dock she had originally been in, but they had to make sure that the tide was high enough for the keel to be clear of the sill of the dock and on July 19th she made it. The keel cleared the sill of the dock by 7 inches and the ship was heard to sigh with relief. Apparently!! Ian pointed out that the date July 19 was a very significant date in the history of Brunel and his ships: the Great Western was launched on that date in 1837, the keel of the SS Great Britain was laid on that date in 1839, the SS Great Britain was launched on that date in 1843 and on that date in1970 she got into the dock on her return from Falklands. A strange coincidence. On her return the ship was in a very poor condition and Ian showed us several pictures of before and after the renovations. So far this seems to be working well but is expensive to run!! What they have done with the restoration is to reflect the various stages of the ship’s history. They have parts showing its life as a transatlantic liner with the first class promenade deck and first class cabins, the family and steerage accommodation on trips to Melbourne, and what it was like when it was a troop ship and a cargo ship. A recent innovation has been the recreation of the galley complete with cat and rats! Computer images not real ones Ian hastened to add!!! They have also recreated a first class dining room from the 1840’s, which is used for functions and recently they have even managed to recreate smoke coming out of the funnel using water vapour, which Ian said was an amazing sight. They now get over 200,000 visitors per year. You can also “Go Aloft” and climb up the rigging. Not something Ian is prepared to do, however! Ian ended by telling us of a future plan. 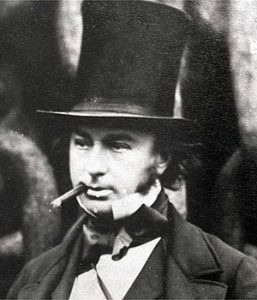 Brunel is acknowledged as one of the most influential British engineers of the past yet there is nowhere to learn the whole story about him and his achievements. Two years ago the Great Britain Trust got funding to develop a national Brunel Museum and this will be sited next to the SS Great Britain. There will be a new build, opening in March 2018 and the old Dock Office of the Great Western Steamship Company will be restored to how it looked in Brunel’s time. They will also recreate Brunel’s drawing office. 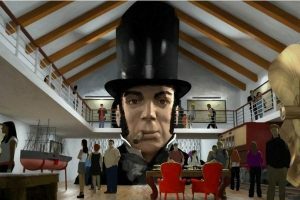 Visitors to the new museum will be greeted by a 2 storey head of Brunel which is currently under construction. Apparently visitors will go up to a mezzanine floor and enter the exhibition through one of his ears and exit through the other!! What is particularly exciting is that they have access to a private collection of documents relating to Brunel the man as well as the engineer which has not been seen by the public before. Ian ended by showing two items from this collection which he particularly liked; a penknife with Brunel’s initials on it and a leather cigar case embossed with his initials and containing his last cigar! Ian was an excellent communicator and gave a very interesting and informative talk The SS Great Britain sounds a good place to visit! !